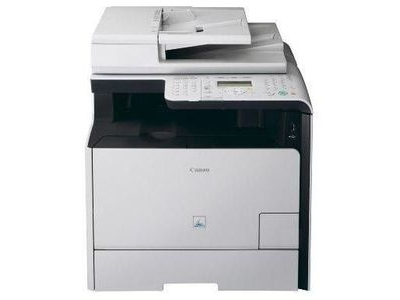 The Canon ImageCLASS MF8350Cdn is a color multifunction laser printer that offers many features standard on more expensive machines at a fairly inexpensive entry point. The MF8350Cdn measures 17" by 19.1" by 18.9" and weighs 64.2 lbs without consumables installed. Its footprint is consistent with many models like it, but its overall weight is considerably lower than most MFPs, which often weigh well over 100 lbs. It will fit alongside other equipment on a desk, on its own table, or upon a credenza with little trouble. The MF8350Cdn's copier supports a maximum resolution of 600 by 600 dpi and produces copies at a speed of 21 copies per minute in either color or in black and white, slightly above the standard speeds offered by most higher-throughput systems and considerably faster than other consumer laser printers, which often print in the range of 10-15 pages per minute. The copier's zoom allows documents to be reduced or enlarged between 25% and 400% in 1% increments and in up to 256 levels of halftones. It includes a 50-sheet document feeder and can make copies up to 8.5" by 11" on its platen and from sizes between 5.5" by 5" to 8.5" by 14" when using the automatic document feeder. It also supports Frame Erase, Memory Sort, 2 on 1, 4 on 1, ID Card Copy, Sharpness, and Auto Size Select features. The unit can contain 350 sheets when in its standard configuration and 550 when upgraded. The unit's ADF and multipurpose tray have 50-sheet capacities, and the main tray takes up to 250 sheets, expandable by adding another 250-sheet tray to the unit. The printer produces documents up to 600 by 600 dpi at equivalent quality to 2400 by 600 dpi, and supports several Canon color imaging technologies: Auto Gradation Adjustment, Pure Black Technology, and Dual Direct Mapping are all available. The scanner can perform optical scans of documents up to 600 by 600 dpi and interpolated scans up to 9600 by 9600 dpi at 24-bit color depth, well above what many other MFPs' scanners offer. It includes support for Scan to PC, Pull Scan, Scan to USB, Color/Mono Distinction, Negative/Positive Reversal, and Mirror Imaging. It can produce images out to PDF, JPEG, TIFF, BMP, Compressed PDF, and Searchable PDF formats. The fax transmits documents at a maximum speed of 33.6 Kbps and at the maximum resolution of 406 by 391 dpi. Its memory stores up to 512 pages and includes support for speed dialing (19 one-touch, 181 coded), group dialing to 199 destinations, and can be configured in receive modes Fax Only, Manual, Answering, and Fax/Tel Auto Switch. It also includes support for Remote RX, Dual Access, Ring Pattern Detection, Error Correction, Auto Redial, and Fax Activity Reports as well as PC Fax, Fax Forwarding, and a 5-minute memory backup in the event of power failure. The unit includes duplex handling of documents as a standard feature, a major convenience. Other, more complicated paper handling options are not available with this system. The unit connects via USB 2.0 and 10/100Base-TX Ethernet, making it compatible with most systems either through a direct connection or, more likely, through networking. While the printer advertises support for Windows and Mac OS X thorugh its included drivers, network users cannot perform scans from Mac OS X (scans can be done if the printer is connected to a Windows system or directly via USB). However, one can use the printer's Scan-to-USB function and built-in controls to sidestep using the computer altogether and scan directly to an external storage device. 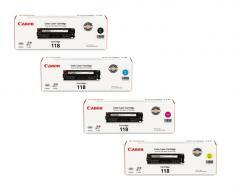 Review it: "Canon imageCLASS MF8350Cdn "
The printer consumes four cartridges for black, cyan, magenta, and yellow toner. Black cartridges yield approximately 3400 pages based on ISO standards and all color cartridges are rated at 2900 pages. 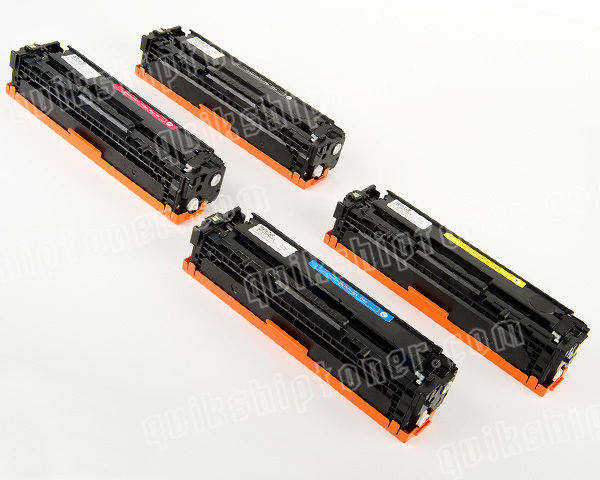 Because this is a lower-end system and to make its use more convenient, the toner and drum unit are integrated into a single package with consumables. This brings up long-term costs (note that many reports concerning this printer complain of the high cost of black toner), but does increase convenience and reduce the amount of maintenance necessary to keep the printer running.